There is a scene in the 2008 comedy Step Brothers in which the deadbeat kidults played by Will Ferrell and John C Reilly burst in to their parents’ bedroom with a breathless proposal: can they get bunk beds? More than a decade later, it seems that hoteliers are seeing the good sense in Brennan and Dale’s argument that “it would be very prudent” (for their profit margins), and “the funnest night ever” (for guests). Vogue has identified a trend of chic hotels offering private bunk rooms: not the 12-to-a-dorm, backpacker-battery farms for travellers on a budget, but high-end luxury spaces to be shared by friends. The Siren in Detroit advertises its twin bunk-bed room, “The Hideout”, as “ideally appointed for friends on an adventure, tycoons in training or children with parents across the hall”, from $159 (£122) per night. Amsterdam’s Volkshotel charges up to €558 (£480) for its standard “L” room that sleeps four, including two in a double bed suspended from the ceiling – “for those who like to be on top of things”. 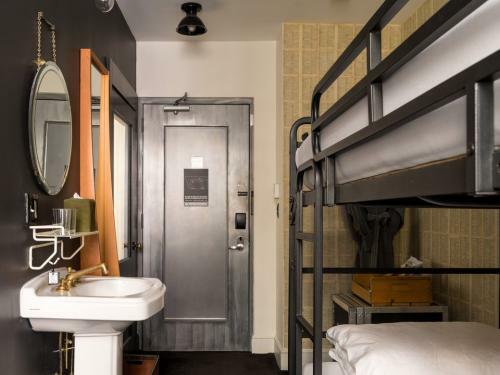 At the Ace hotel in New York, the bunk-bed room – with its steel bedframe and door, walls pasted with reading material, and sink within arm’s reach of the pillow – is reminiscent of a peculiarly Instagram-friendly prison cell, if prison cells also offered a private photobooth and cost $519 per night. And at Liverpool’s Shankly hotel, the Flamingo party suite has six double beds stacked on top of each other – as if the overarching theme of former Liverpool manager Bill Shankly weren’t novelty enough. Top bunks are demanding top dollar, and it is said to be millennials driving demand – although not because years of renting in overcrowded cities has made them comfortable with cramped living conditions. This has been held up as further evidence of the so-called “experience economy”, wherein Generation Y spends its disposable income on doing things that will make for good content on Instagram, such as going to a cat cafe, or Fyre festival. Frankly, as a motivating force it is exaggerated, linked to alleged upticks in everything from hanging flower baskets to super yachts and everything else that people have always bought, but which have been held up as betraying some insight into the millennial generation. Usually it’s that we have more money than sense, but not enough for a house or children, and are caught in a state of arrested development as a result. In this case, and so many others, it’s surely not that deep. Honestly, who wouldn’t want a bunk bed? Ikea’s description of them as “much more fun than an ordinary bed” goes nowhere near far enough. Bunk beds are the essence of fun, rendered in steel or wood like some kind of totem to novelty. Maybe it’s the combination of physical proximity without any potential for eye contact, fostering late-night confidences. For life’s top-bunkers, the draw could be the hint of danger that comes with combining sleep and suspension, thrillingly exacerbated in the case of self-assembly. Either way, bunk beds are so fundamentally exciting that as a child you don’t see them for the Trojan horse they are: a way for your parents to con you into sharing a room with your sibling. In adulthood, they are immature, impractical and an impediment to physical intimacy. But for one night in a hotel, it would be hard to resist.